PWC’s 2nd Healthy Lifestyle Challenge is soon to begin on Monday, October 12th. I’m looking forward to participating in this Challenge with you, regardless of whether or not you participated in our last Healthy Lifestyle Challenge. If you’d like to join me, please let me know in a comment below! If you know of anyone else who might be interested, please forward this post so they can join in too! For those of you thinking this might be too challenging a commitment, STOP! Remember, you can do whatever you set your mind to do. What’s important here is that each day you try your best to reach your goals. That’s what matters. In the end, it’s not about how successful you are everyday. Instead, it’s about the significant changes that are happening in your life when you make steps—even if they’re small—everyday towards developing healthier lifestyle habits. There’ll be a few changes from the last Challenge, but for the most part this one will be very similar. As with the last Challenge, this one will last 4 weeks, ending on Friday, November 6th. We will measure our success by a point system. A perfect day will consist of 100 points. Most of us will rarely get a perfect score of 100 points each day, but it’s a goal that can act as an incentive to motivate us to reach as many points as possible every day. 5 COMMUNICATION Points: You will earn communication points by posting a comment or update on the group Facebook page or communicating with anyone else participating in the Challenge every day. 10 WATER Points: You will earn water points by drinking 64 ounces water/day. 10 SLEEP Points: You will earn sleep points by sleeping (or being in bed trying to sleep) for a minimum of seven hours each night. 20 EXERCISE Points: You will earn exercise points by doing some form of exercise at least 20 minutes/day. New this round! You can earn a 10 point daily bonus for walking 10,000 steps/day and an additional 10 points if you walk 20,000 steps/day. That is to say, you can earn as many as 30 exercise points each day you walk as many as 10K steps and 40 exercise points each day you walk as many as 20K steps. Eat a balanced (including protein, carbohydrate and fat) breakfast within an hour of waking. Contain your eating to 12 hours a day, or less. See this article. Practice Hara Hachi Bu. That is, eat only until you’re 80% full. You can actually say this before each meal to remind yourself to not stuff yourself at mealtimes. Eat meals free of distractions (electronic devices, magazines, books, etc. ), especially if and when eating alone. The first few times you eat alone this way, you might feel uncomfortable. You’ll want to reach for your phone, go to your computer, grab a magazine, or something, anything…. This will be the challenge, don’t give in!!! Take a break to eat mindfully. 35 NUTRITION Points: I’ve dedicated the most number of points here because I think nutrition plays such a significant role in our overall health and well-being. I’ll write more about my thoughts on nutrition in my next post, but for now, suffice it to say that you will earn nutrition points by eating a whole-food, plant-based (WFPB) diet. Please note a WFPB diet does not necessarily mean a vegan or vegetarian diet. Instead, it is a diet rich in fruits, vegetables, whole grains, legumes, and tubers. It can EITHER exclude or minimize animal proteins that include meat, dairy products, and eggs, as well as processed and refined foods such as bleached flour, refined sugar and oils. So if you currently consume animal proteins, your challenge will be to find ways to minimize your consumption to make room for more whole foods. For those of you who are vegans or vegetarians, your challenge will be to minimize your consumption of animal proteins (dairy and eggs for vegetarians) and refined/processed foods to make room for more whole foods. Partial points cannot be earned per category. For example, you must drink all your water to earn 10 points; you must be in bed at least 7 hours to earn 20 points; etc. Points for Eating Habits is a bit different in that there are five tasks to complete. New this round! You will only need to do three of the four eating habits to earn 20 points. If you do all four in one day, you will earn 20 points, plus a bonus of 10 points. If you only complete 2 of the 4 habits, you receive zero points. It’s a Challenge…. It might be challenging, but it’s possible! On the group Facebook page I’ll post daily or weekly bonus points and incentives to keep going! New this round! : there will be a 5-point per portion Alcohol penalty. A portion equals any amount of alcohol up to 6 ounces of wine, 12 ounces of beer, or 1.5 ounces of hard liquor. Alcohol may be consumed freely on the day off. New this round! : there will be a 5 point smoking penalty. As white flour and white sugar are poor nutrition choices for anyone, there will be a 5-point penalty for the consumption of white flour and processed sweet treats during the Challenge. Watch this one my friends! You will need to become a label reader if you eat a lot of packaged food. Anything with over 5 grams of added sugars is considered a “sweet treat” (naturally occurring sugars, like fruit or milk don’t count as penalties for this Challenge). Nearly all bars (even the “healthy” ones), canned fruit, cereals, even sauces contain added sugar. This really adds up to our over consumption of sugar. This is a strict rule for the Challenge. Avoiding sugar and flour will help steer your food choices naturally toward whole and nutritious food options, as well as teach your body to start burning fats as a stable source of energy rather than carbohydrates. These penalties may likely be one of the hardest parts of the Challenge for many of us at first, but you will soon start to see and feel the benefits QUICKLY! This means, a perfect weekly score will total 600 points per week. There are no eligibility limitations; making healthy choices is for everyone. All are welcome to join! However, I’d recommend you consult with a physician before starting any nutrition, exercise, or weight-loss program. If you’d like to join me, you are welcome. I’d love to work on this challenge with you! Let me know. Also, don’t hesitate to write a comment or send an email if you have any questions! And now finally, on to the recipe! 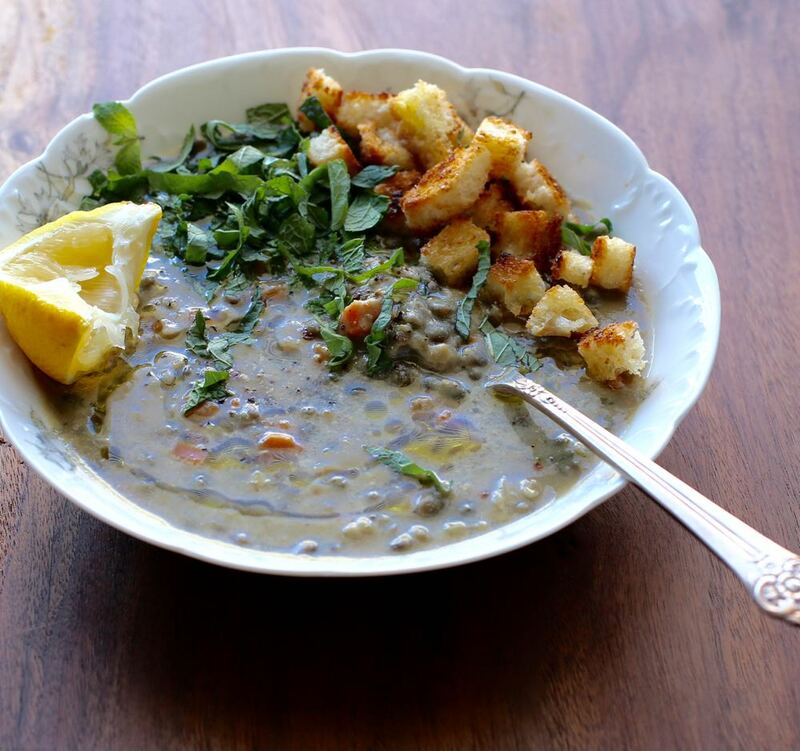 Rinse the lentils and combine them in a large soup pot with 4 cups vegetable stock or water. Bring water to a boil, then reduce heat and allow the lentils to simmer until tender, yet firm, about 25 minutes. After the first 20 or so minutes, add salt. move from heat and skim off any foam that may be on top. Meanwhile, puree garbanzo beans, 1 tablespoon lemon juice, 1/4 cup stock or water, 2 tablespoons olive oil, half of the garlic and a generous pinch of salt in high speed mixer or food processor. Set aside. Heat 1-2 tablespoons oil in a large pan. Add onion and allow to cook until translucent, about 8-10 minutes. Add remaining garlic and stir until fragrant, about 1-2 minutes. Add carrots and a generous pinch of salt and cook until carrots soften a bit. Add the onions and carrots to the lentils and their broth and simmer gently for another 15-20 minutes or so. Add garbanzo puree, mint, 1 tablespoon lemon juice and harissa, if using (if you prefer, you can add the harissa when serving). Simmer for another 5-10 minutes. Taste and adjust seasoning adding more salt, black pepper, mint and/or lemon juice. If you find the stew too thick, add more stock or water then taste and adjust seasoning again. Remove from heat. 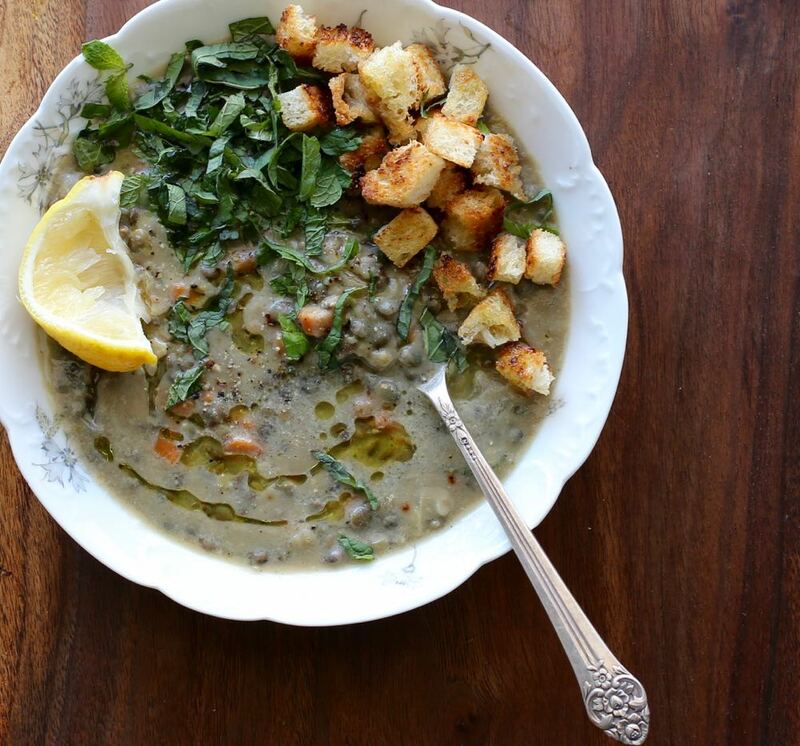 Ladle into bowls and serve with optional toppings: a few drops of olive oil, chopped fresh mint, garlicky croutons, harissa paste, and/or lemon wedges. Note: When dicing your carrots, think of the comfort of those you will eat your stew. Dice them small.